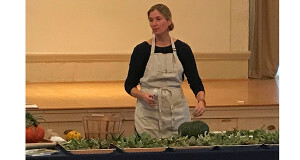 Trickett brought two succulent pumpkin centerpieces to her workshop. 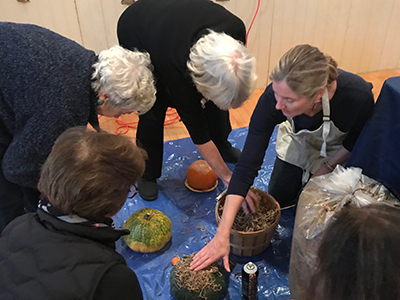 On Tuesday, November 13, members of the Sherborn Garden Club and other residents of the community visited the Sherborn Community Center to learn how to make succulent pumpkin centerpieces. Owner of The Captured Garden Deborah Trickett shows members of the Garden Club how to make a succulent pumpkin centerpiece during her workshop. The owner of The Captured Garden, Deborah Trickett, ran the workshops, and she explained why these pumpkin centerpieces are particularly useful at this time of year. The centerpieces consisted of normal pumpkins with succulents (juicy leaves) glued on top for decoration. Trickett brought a variety of succulents to the workshop, which were all “different shapes and sizes and colors,” as well as a couple of examples of centerpieces that she made previously. There were around 20 community members who showed up to the class, and they were all interested in creating these household decorations. “We think it’s a fine opportunity to see town community members and do something creative,” added another Garden Club board member, Lauren Guillette. Trickett began the workshop by describing the fascination people have with succulent pumpkin centerpieces. Then, she showed the group the different type of succulents and explained the process for making the centerpieces. Then, with the instruction of Trickett, the group grabbed their own pumpkins and started making their decorations. Deborah Trickett shows members of the Garden Club how to glue succulents to pumpkins during her workshop. “To me, it’s always fun to see how people interpret it,” Trickett explained. Trickett further explained why she enjoys creating these pumpkin centerpieces.